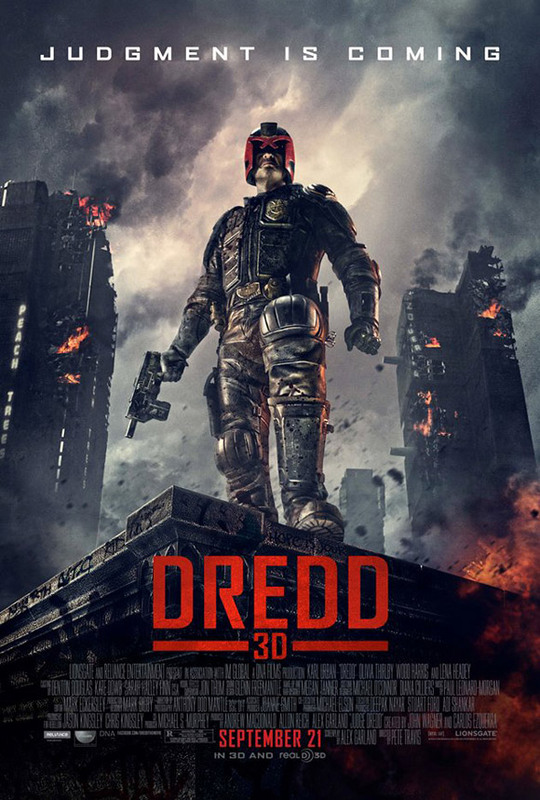 Will you see Dredd 3D in the theater? I need to dig up Stallone's version up at the Library. It's been years since watching it. I don't remember much of it at all other than his "I'm the law" soundbite. As for this version, it looks interesting visually, but at the end of the day this will be a "Waiting for it to hit DVD" for me. I remember the original. Tongue firmly in cheek. Over the top acting. Rob Schneider is odd, but a dose of good humor. This year I was going to skip San Diego Comic-con. I had no new books to sell, and was generally burnt on tabling at this mind-numbingly huge convention. Then I realized that this is Judge Dredd’s 35th anniversary, and the new film is only months away. It’s a good year to go as a fan. Then 2000ad and Lionsgate held a “WHAT WOULD YOU DO TO WIN TICKETS TO SEE DREDD” contest for tickets to an advance screening of the Pete Travis directed “Dredd”. I entered, professing that I would eat munce for a month. I won a pair of tickets, and my fate for July 10th was written in stone (fortunately I haven’t been asked to keep my vow of eating only munce for a month). Come the night of the showing, I asked my good friend and fellow artist Justin Hall to take my +1 seat, which he did. Justin is a life-long fan of all types of comic-books, but has never read any Judge Dredd, so I was very happy to get a non-biased opinion from a good critic. As it turns out, we ended up sitting next to Brandon, then film critic from Bleeding Cool (I am not going to read his review until I am done with my own). I was already trying my hardest not to get my hopes up about DREDD — since this usually leads to utter disappointment with any film— but Brandon said a few things that set the context of this film up for me, and added to some things read on blogs and heard in podcasts put me in just the right place to see the movie. I’ll list these things first. 1, The costumes are very much like Carlos Ezquerra’s original design. 2, Ron Smith’s Mega-City 1 was blocky and inorganic. 3, The budget was low on this film ($45mil) and therefore the final product is practically an art-house film. 4, John Wagner approves of it, his most noted gripe being with the vehicles; he felt they looked too present-day. It’s not an epic film, but it doesn’t need to be. There’s one simple story that intoduces us to Dredd, Anderson, the Justice System, and Mega-City 1. Very quickly the film settles onto the setting of Peach Trees block, and stays there for the rest of the film. As you (fans) all probably know by now, Dredd is giving Cadet Anderson her full-eagle assessment. They are tracking Madeline “Ma Ma” Madrigal and her Slo-Mo drug ring to it’s source. The two Judges wind up with a prisoner who knows too much about Mardrigal’s operation for her to allow him to be taken alive and be interrogated. Her people assume control of the block defenses and are able to trap Dredd, Anderson, and their prisoner inside. The rest of the film is a simple game of survival, and in this game the movie viewer gets a perfect introduction to Dredd’s world. Here we see the harsh violence of the world, garish and brutal, juxtaposed with incredible beauty, even amidst gratuitous carnage and dismemberment. People fall from the block’s heights in ways that are scary and inviting at the same time, rendered hypnotic and dazzling due to the effects of the Slo-Mo drug, and the artistry of the cinematography and 3D effects. We see Dredd as a law machine, dispencing Justice, but never grand-standing. 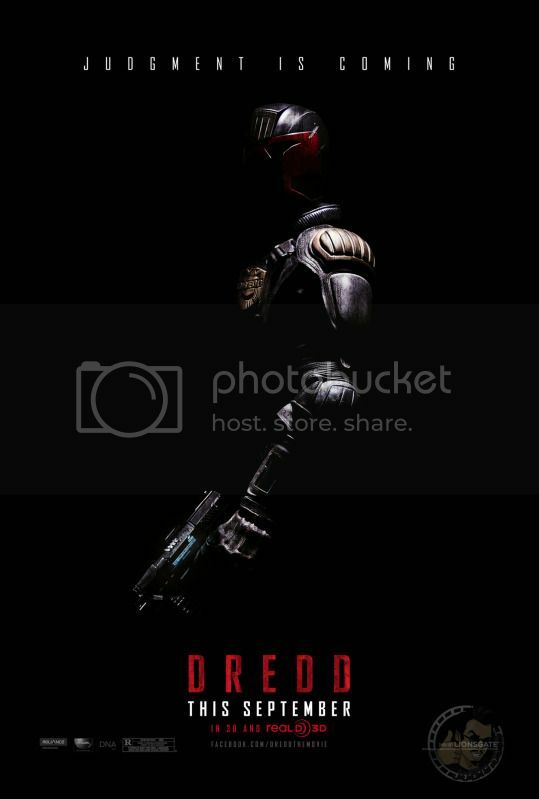 I am not giving away much by saying one of the best scenes in the film shows Dredd emerging from the cloud of dust, having just survived an attack that blew bullets from the inner courtyard of the block through to the outer blast armor, destroying a good many apartments and people. He emerges carrying Madrigal’s second in command, tosses him off of the balcony, and before “Ma Ma” has returned her gaze to Dredd, he has already walked matter-of-factly back into the dust cloud. No one-liners, no threats. His disdain for Madrigal apparent from his lack of concern for her reaction. We see Anderson, too unconventional to be a regular street Judge, prove her worth to a man who had already dismissed her as a failure. Anderson is a Psi Judges, and in this era (set before the beginning of the comic series) the Justice Department’s Psychic Division is undeveloped… they are at this time seen only as mutants and have significant stigma to overcome…but you can guess that they prove their worth as tools of the system. As a comic book geek of many years, I’m certainly aware of the world of Judge Dredd; many of the creators I most admire cut their teeth with that property. However, I’m certainly no expert, and am, like most Americans, not emotionally invested in the Judge Dredd mythos. So I came to the movie with a fairly blank, though positive, state of mind. And I was quite pleased with what I saw! The two main characters Judge Dredd and Judge Andersen were well portrayed, the direction and filming were good, and the concepts were compelling. It was a simple story, and left me hoping for a bit more complexity in terms of character development and thematic arcs, but overall it was a very solid movie. The real star of the film was the setting; Mega City 1 was well conceived, as was the Peach Trees housing complex where the action takes place, and the washed out colors and claustrophobic filming really brought home the sense of the Judge Dredd dystopian future. This bleakness was afforded moments of unexpected relief by the segments dealing with the narcotic that the plot revolved around; the gorgeous, slow motion photography gave the film moments of surreal beauty. I saw the 1995 film when it came out. I wanted to like it. I own the dvd, and watch it from time to time. Depending on my mood, I may say it was okay, or not. There was so much wrong with it. I watched it again last night, and you know what? Stallone isn’t even the worst thing about that film. You need to forgive more than half of that movie to even enjoy it. You don’t have to forgive ANYTHING. I'm still waiting for the Library to tell me to come and pick up my copy. It's been years since I've watched it. I think this is going to be add a new dimension. Just enough to make it stand out. Total cost of production - $50 Million = Cheap movie by Hollywood standards. Opening weekend haul - $6.3 Million = BOMB. This is gonna hit DVD sooner than you think. Ya, not sure this was on many people radar as must remake. I never thought this stood a chance of being a 'hit', but I certainly didn't foresee such a low number either. I figured it would pull anywhere from $15 - $20 Million. Not even close.